Sucre, our home for a year, is one of Latin America’s most beautiful cities. Crammed full of colonial architectural gems that are painted white by order of the city authorities, and laid out in a typical Spanish grid system centred around a leafy central plaza, it can sometimes feel like you’ve stepped back in time. It boasts one of the continent’s oldest universities – making it a centre for progressive thought and politics – no surprise then that Sucre is where Bolivian Independence from Spain was proclaimed or that it remains a centre of dissenting thought. It is rightly considered a university town, and at times it literally buzzes with the number of students pouring out into the streets and plazas after classes. 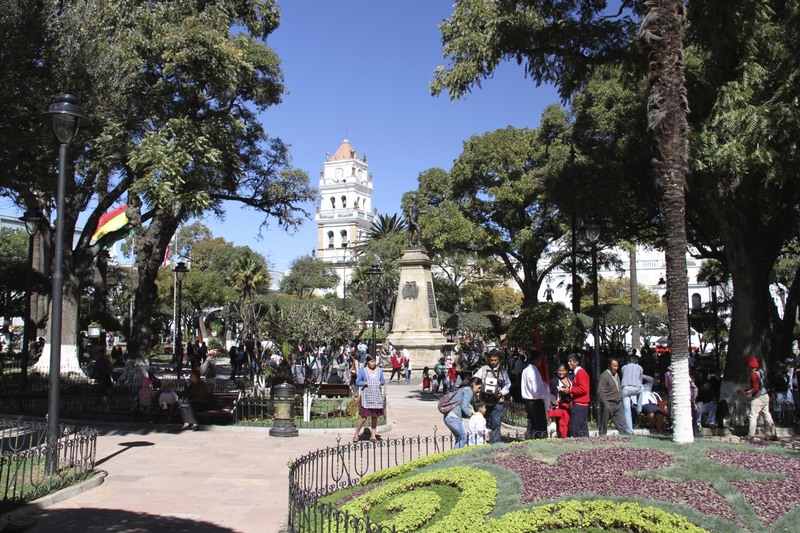 It is also the judicial capital of the country, and although political power passed to La Paz some time ago it is recognised in the constitution as Bolivia’s capital. Nestling in a hollow, with the spectacular backdrop of the Cordillera de los Frailles, at an altitude of 2700 meters it is easier on the lungs than La Paz or Potosi. 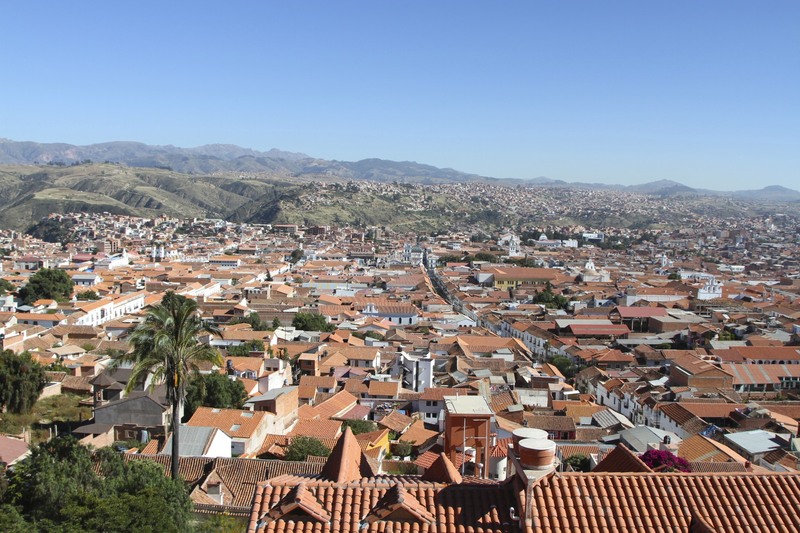 It’s location between the high Altiplano and the low tropical regions of Bolivia give Sucre a climate to envy. Almost daily blue skies and a temperature seemingly stuck in the mid-20s Celcius certainly make it an improvement on the United Kingdom – although we’ve yet to experience the rainy season! Sucre oozes the sort of charm that makes people stay a month rather than a week, and convinces people to return to spend a year here. Yet, for all its charm and veneer of wealth, take a peek behind the colonial façade and you’ll find another city, one where poverty is a daily reality. Like the rest of Bolivia, Sucre is a city of contrasts with wealth and opportunity co-existing uneasily alongside entrenched poverty. Spend more than a few minutes in Plaza 25 de Mayo and you’ll be approached by working street children trying to make a few Bolivianos to support their families from shining shoes, or just asking if you’ll buy them a glass of orange juice from a street vendor. Walk the touristy streets and you’ll be approached by poor men and women, known as Campesinos, selling fruit, vegetables or weavings from their villages in the surrounding countryside. Take a ride out of the centre en route to the beautiful countryside surrounding Sucre and you’ll pass through very poor barrios of Campesinos, recently arrived from rural areas to escape the grinding poverty and harsh conditions of life in the countryside. All of them seeking a better life for themselves and their families. This ‘other’ Sucre is easy to miss if you’re a tourist passing through, or easy to ignore if you’re a Bolivian or foreigner living here. Before we arrived from London we already knew we wanted to volunteer for some of the excellent organisations that are working to provide people and communities with the opportunities and resources to pull themselves out of poverty. Not big international NGOs or the UN, but small community-based organisations that are working directly with communities. Three organisations that we’ve built relationships with, and with whom we hope to spend more time volunteering, are BiblioWorks (http://biblioworks.org/), Condor Trekkers (www.condortrekkers.org/) and Inti Magazine (http://inti-revista.org/). All three gratefully accept donations, but also need volunteers, so if you happen to be passing through Sucre and would like to see another side of this beautiful city get in touch via their websites. BiblioWorks (http://biblioworks.org/) is a non-profit organization committed to provide communities in need with tools and resources to develop sustainable literacy and education programs through funding and book and material donations for schools, libraries, and cultural institutions. They currently run eight libraries (with more on the way) in some of the poorest communities in the countryside surrounding Sucre promoting education, literacy and community engagement in cultural activities. Condortrekkers (www.condortrekkers.org/) is a non-profit organization that is promoting responsible, ethical tourism in and around Sucre. The money received from trekking groups goes to benefit the communities that the treks pass through and to projects and groups working in Sucre. 100% of profits support development and social projects, including support for schools in rural communities and street children in Sucre. Inti Magazine (http://inti-revista.org/) is a community-based organisation dedicated to working with, and improving the lives of the working children of Sucre. Inti is not an NGO, but a private enterprise that evolved organically from a desire to help the working children of Sucre. Inti is sold by working children aged 7 to 14 years to supplement their family income and provide a means to stop working on the streets and stay in school. The magazine is partly written and illustrated by the children themselves, encouraging learning and self-expression and also critical to raising their self-esteem.